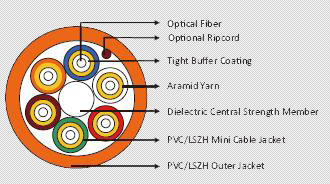 The cable contains 2 to 36 fibers which are individually buffered tight or semi-tight construction. Each fiber is individually protected in a mini cable. Aramid yarn will be applied either inside the mini cable or within the inner jacket of the cable. The color coded mini cable may be stranded around a central strength member which can be either FRP or flexible all-dielectric. Outer Jacket may be PVC or LSZH. Temperature Range: Cyclic Flexing: 25 cycles for armoured cables. 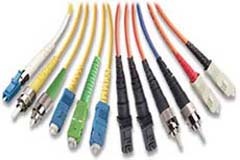 Operating Temperature Range: -40℃(-40℉) to +70℃(+158℉) 100 cycles for unarmoured cables. Copyright © 1995, ATL Technology Ltd. All rights are reserved.